Not all SRTS activities require grants. Many projects can be implemented at little or no cost. This calendar provides information on 31 activities you can include as part of your SRTS program. Short descriptions of each idea are available below. Pick a few ideas and use them to celebrate Walktober, April’s Earth Month, the Physical Fitness and Sports month of May or any month of the year and have fun! (1) Walk to School Poster Contest – Hold an art contest. Design a banner or poster to be hung in town or school to promote walking and safety. (2) Conduct a survey/needs assessment of students and parents about walking to school – Analyze information on students’ and parents’ views towards walking and biking to school, include questions about obstacles to walking or biking to school. (3) Create frequent walker cards or frequent rider miles – Create a reward program similar to food and retail store discount cards. The cards are punched according to every time a student travels by foot or accumulates a certain number of miles. (4) Run a “Keep Kids Alive Drive 25” campaign –Educate and encourage citizens to drive at the residential speed limit to make a safer walking environment for students going to school. (5) Celebrate International Walk to School Day – Celebrate iWalk, and join students around the world by walking to school to create communities that are safe to walk. (6) Paint new high visibility crosswalks – Work with your municipal engineer and public works department to improve safety and emphasize the recommended path for crossing at an intersection. (7) Develop a Neighborhood Watch or Safe Haven program – Have residents volunteer their homes as “safehouses” where children can go if they feel they are threatened or endangered on their way to and from school. (8) Pledge to be a PACE Car and Always Drive 25 – Drivers of PACE cars pledge to drive within the speed limit and stop for pedestrians. PACE cars become traffic calming devices. Create PACE car pledges for parents to sign. (9) Create a Safety Alert Notice – Initiate a program where if a parent is double parked or parked at a crosswalk, they will be handed a safety alert ticket by the principal or safety patrol. (10) Celebrate Christopher Columbus by Exploring Your Neighborhood – Create a story out of found objects. Have students find things in the neighborhood and share with classmates. (12) Designate Every Wednesday Walk n’Wheel Wednesday – Create a weekly event that encourages kids to walk and bike to school through rewards and outreach. (13) Hold a Bicycle Rodeo – Host a community event where cycling instructors teach safety riding skills through obstacle course simulations. (15) Hold a Walk-a-Thon to Raise Money and Awareness – Encourage people to walk, expand awareness for SRTS and raise money for SRTS future programs and physical pedestrian/bicycle improvements. (16) Create No Idling Zones around the school – Children’s asthma symptoms increase as a result of car exhaust. Idling produces twice as much pollution as stopping and restarting a warmed-up engine. A single vehicle dropping off and picking up kids at one school puts about three pounds of pollution into the air per month. (17) Hold a Bicycle and Pedestrian Safety Quiz Show – Have students play a game modeled after Jeopardy to learn bicycle and pedestrian safety. Construction paper, point values, questions and a bulletin board are helpful to display the game. (18) Designate a location for park and walk to school – Drop off students at a designated location and walk the rest of the way to school under the supervision of an adult volunteer. (19) Hold a Walk to School Pride Day – Paint symbols like footprints or the school mascot on the sidewalk or shoulder along school route. (20) Walk a Morning Mile at School – In areas where it is unsafe or difficult to walk to school, school staff can start a walking program on-campus before, during or after school. An example is the “Morning Mile”, where students walk a mile around the school grounds before class begins. (21) Conduct a Class Walking Field Trip – Take students on a field trip by walking to a local library, post office, or City Hall. Incorporate math skills by having students count their steps or calculate how far they walked. 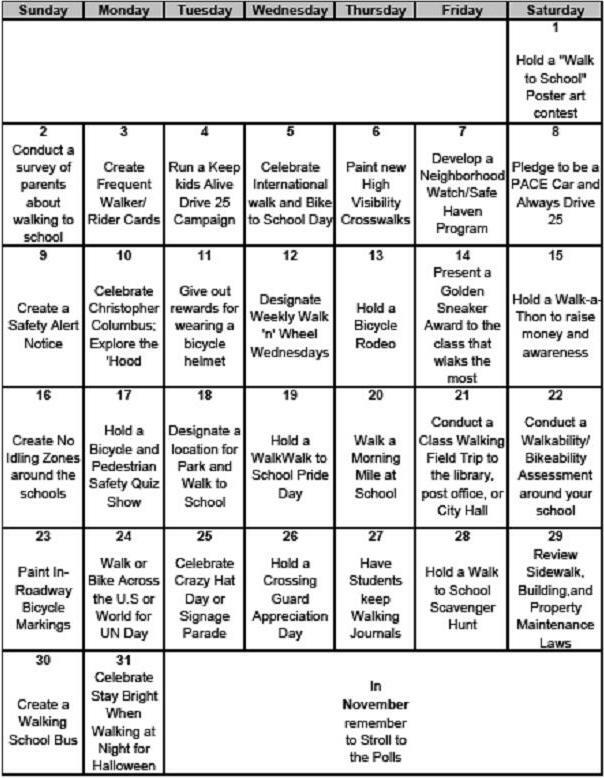 (22) Conduct Walkability/Bikeability Assessment around your school – Evaluate and identify school routes that are in need of improvements by gathering volunteers to walk designated routes with a walkability/bikeability checklist. (23) Paint In-Roadway Bicycle Markings – Work with your municipal engineer to create bike lanes that connect schools, parks, residential and commercial areas. (24) Walk Across America or the World for UN Day – Have students travel around the country according to how many miles a class collectively walk and bike to school through a web-based interactive game. Or, celebrate UN day by following the journals of Gary Hause, a man walking around the world. (25) Celebrate Crazy Hat Day or Signage Parade – Decorate helmets, hats and signs to create a parade on the walk to school. (26) Hold a Crossing Guard Appreciation Day – Designate a day in appreciation of the work that crossing guards do to keep students safe when crossing busy streets. Encourage students to make thank you notes for their crossing guard. (27) Have students keep a Walking Journal – Create a classroom story about walking to school. Students jot down what they see on their walk to school and can even create a photo log of what they like and do not like along their route to school. (28) Hold a Walk to School Scavenger Hunt – Create a walking game where students spot objects on their walk to school, based on a classroom assignment. For example, have students make note of the different types of traffic signs on the walk to school. (29) Review Sidewalk, Building, and Property Maintenance Laws – Designate a small committee to review municipal laws and codes to ensure sidewalks and trails are built with new developments. Make sure sidewalks are maintained, especially during snowy months. (30) Create a Walking School Bus – Design a walking route to school, supervised by an adult, with stops and a schedule like a school bus. (31) Celebrate “Stay Bright When Walking at Night” for Halloween – Encourage students to walk in bright, reflective colors and teach them the importance of pedestrian safety on Halloween night.